Tyne Bridge and The Angel Of The North to name a few. every year to sample the city’s much discussed nightlife. Newcastle does not just appeal to party goers however, as a city it has so much more to offer. The bars, pubs, clubs and hotels within the city centre make Newcastle perfect for a weekend getaway. In contrast, the city’s more exclusive locations such as The Close House Hotel and Slaley Hall are very popular as wedding venues, cementing Newcastle’s appeal as both a lively night scene and an upmarket pocket of the North East region. 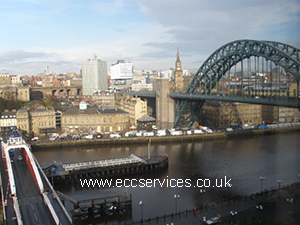 When it comes to event catering in Newcastle, Executive Catering Services are experienced in catering for a whole range of events within the city. Established in 1984, the business has been supplying the Newcastle area with quality catering for almost 30 years, a great achievement given the amount of competition within the Newcastle area. As a company Executive Coach and Catering Services offer a vast range of catering options which can each be tailored to suit the needs of customers. The range includes simple options such as Hot buffet menus and finger buffet menus, stretching to complex mass catering choices such as hog roasts, spit roasts and barbecues. Hog roasts are a very popular option for catering in Newcastle, particularly at wedding receptions, birthday parties and markets. The company provides a hog roast for at least one event in Newcastle every week during the peak season. The five day Christmas market event held in Newcastle every December is also very popular and has helped build the company’s reputation in the Newcastle area. As well as offering a range of food catering options the company also offers a mobile bar service. A combination of food and beverage catering has proved to be very popular at the events Executive Catering Services have previously catered for in the Newcastle area. Similar to the food options, the bar and its contents can be chosen by the customers, this helps create an event which is unique and specific to both guests and hosts. These are just a few of our food services we offer please take a look around the site to find more catering options or give us a ring we are more than happy to give you some ideas and assistance.